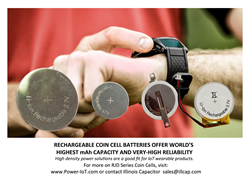 Illinois Capacitor is now offering rechargeable coin cell batteries. These are high density power solutions that are a good fit for IoT wearable products, offer greater reliability and have more density per cell than older designs. Illinois Cappcitor is now offering RJD Series batteries which are different in design from other lithium ion coin-cell batteries. A new encapsulation technology significantly increases storage capacity by completely utilizing the space within the cell case. High power density is a significant benefit in IoT wearable applications. Not only has the energy density per cell been improved, the failure rate is superior to older designs. Encapsulation, unlike conventional stacking construction, has resolved older manufacturing issues which can affect safety and reliability. As a result, RJD Series batteries allow manufacturers to offer new levels of performance without product redesign. With the increased performance levels, product run time can be increased by 20% or more vs. a conventional lithium rechargeable coin cell battery. Alternatively, if product size is most critical, performance levels can be maintained with a physically smaller cell. Because of their internal encapsulation construction, UL-Listed RJD cells also offer greater reliability and safety. This is because they are more resistant to overheating than conventional coin-cell batteries; and their patented technology virtually eliminates risk of internal shorts. RJD Coin Cells are available in eight different capacity levels, leaded or with conventional flat terminals. Each is rated at: 3.7 VDC (4.2 VDC to 3.0 VDC). Operating temperature range is -20 °C to +60 °C. Applications include any type of portable product that is currently powered by rechargeable coin cell batteries. These include smart watches, fitness bands and other IoT applications, as well as automotive dash cams, key fobs, memory backup, security devices and numerous consumer electronics products. OEM pricing starts at $3.50 each. For more information, visit: http://www.illinoiscapacitor.com/ic_power/ or contact: sales(at)illcap(dot)com or write to Illinois Capacitor, 3757 West Touhy Avenue, Lincolnwood, IL 60712. Illinois Capacitor is a subsidiary of Cornell Dubilier Marketing, and is a global source for world-class capacitors and power components. IC is a leader in board-level capacitors for electronics, lighting, energy and other markets.